One of the most difficult parts of having a second baby is choosing a stroller which can be used for a young baby as well as a toddler. There is such a wide range on the market, making it difficult to know which is best. Here, we have found 9 of the best strollers in a variety of styles. We have outlined the things you should think about before buying a stroller and discussed the key features of each of the 9 strollers. You are sure to find the perfect carriage for your two little darlings here! There are a few things to think about when choosing a double stroller for your infant and toddler. 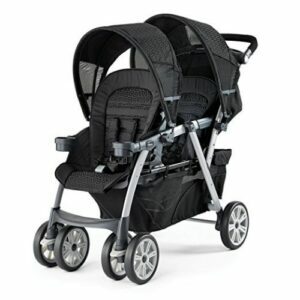 Double strollers vary greatly, so review each one carefully to find the best for your needs. Listed below are a few of the key things to think about when searching for your ideal stroller. Children’s Ages – The most important factor in choosing a stroller for two children is usually their age and size. Each stroller has a different weight capacity, meaning some aren’t suitable for very large toddlers. Taller children may struggle to fit into the seats on some models, so make sure you research the capacity of the seats before buying. 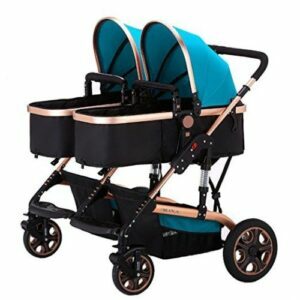 Style – Double strollers come in a variety of styles and seating combinations. If it is important for you to have your baby sitting in a parent-facing direction, make sure at least one of the seats is able to do that. It may be important to have the ability to attach the infant’s car seat to the stroller. You may also wish to consider which terrain you will use the stroller on. Some have tires suitable for off-road use, perfect for going on long walks. Size – These strollers are often large. If you need to take it in the car, be sure to check the folded dimensions to ensure it will fit in the trunk. The same applies if you’re going to keep it in a closet at home. Similarly, think about how easily the stroller can be folded. If you are going to be out without another adult, you may wish to find a model which is easy to fold so you can still keep hold of your infant. 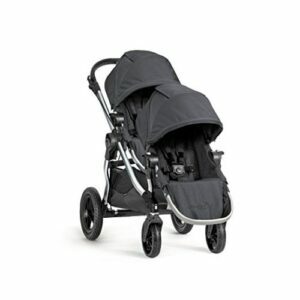 Accessories – Some strollers come with a range of additional accessories. There may be different seats for kids of different ages, a compatible car seat or small accessories. Items such as organizing bags for parents, lap trays for the kids, rain covers and mosquito nets are available for certain models. These are usually available to purchase separately, so make sure any accessories you wish to have are compatible with your model. This is the perfect stroller for busy parents with young children. The special quick-folding technology means it can easily be folded with one hand, leaving the other hand free for holding your infant. It offers a 100-pound capacity, meaning it can be used by two large toddlers. The stroller doesn’t offer different seating arrangements, but they can be reclined to a near flat position, perfect for napping or for very young babies. There is also the option to attach an infant car seat, so you can take your baby into the stroller even if they have fallen asleep in the car. There is a range of handy accessories which are compatible with this product. The Parent Console is perfect to keep snacks, drinks, and toys handy. There’s also a child tray with a cup holder, perfect for lunch and snacks on the go. 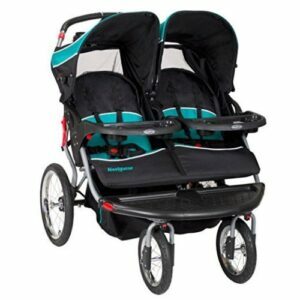 This in-line double stroller is perfect for an infant and a toddler. It accepts all Graco Click Connect infant car seats in one easy step, giving different seating arrangement possibilities. Baby can sit facing mom or dad in the car seat whilst the older child enjoys the view from the front seat. The stroller comes with easy one-handed folding and is relatively lightweight. Both seats can recline, and both come with a tray for your child to keep everything they need at hand. There is a huge storage basket, perfect for carrying everything you need on a day out with two children. The basket can be easily accessed even when the back seat is reclined, so napping kids won’t be disturbed. This stylish tandem stroller is perfect for a baby and a toddler. The rear seat can be removed allowing the older child to stand on the platform. It comes with a removable tray on both child seats, and a parent tray with cup holders. The inline style of this stroller is ideal, as it can easily fit through doors where side-by-side models may not. 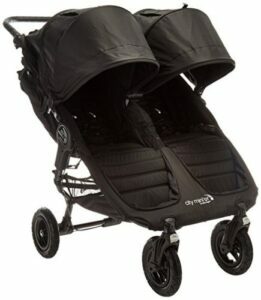 There is the option to add two car seats to this stroller, so you can design your own travel system. The one-handed folding is quick and easy, leaving you free to keep hold of your children. Children weighing up to 50 pounds can ride in this stroller, making it perfect to last until they no longer need one. This side-by-side stroller is great for growing kids. The seats can be reclined independently of each other, and the footrests can also be adjusted to different levels. It has a huge storage basket perfect for carrying everything you need for a baby and a toddler. There are also two storage pockets on the back of the stroller to keep important items close to hand. The tandem stroller can carry up to 90 pounds in total, making it perfect for two toddlers to ride in too. It’s available in a choice of five colors, so you’re sure to find one to suit your style. 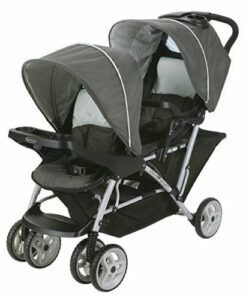 It measures 30 inches across, meaning it can fit through a standard doorway unlike many other strollers of this style. This tandem stroller is perfect for use on all terrains. The pneumatic bicycle-style tires offer a smoother, comfortable ride for your kids. There are trays on both seats, as well as parent tray including a covered storage compartment. The parent tray also includes built-in MP3 connectivity, so you can keep your kids entertained on a long walk. The stroller is designed for jogging, so it handles well when traveling at higher speeds too. It’s possible to attach two Baby Trend infant car seats to give more flexibility in the seating arrangement. The children can weigh up to 50 pounds each, or measure up to 42 inches tall, meaning the stroller will give years of use. This inline tandem stroller is great for either two infants, two toddlers or one of each thanks to the different seating possibilities. It’s possible to add either one or two car seats, meaning you can easily transfer your sleeping infant from the car. The rear seat of this stroller reclines fully, making it perfect for even the tiniest baby. It weighs around 15% less than other similar models. This means it’s easy to lift in and out of the car, and easier to store at home. The zip-up storage basket can be easily accessed even when the rear seat is fully reclined. It can be folded single-handedly and is compact when collapsed. The stroller is also able to stand when folded, meaning you can leave it standing whilst getting the kids sorted. 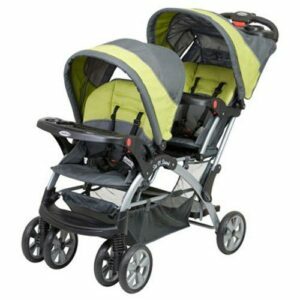 This great, multi-functional double stroller is perfect for using with twins or an infant and a toddler. It comes with two bassinets and two toddler seats, which can be arranged in a variety of different ways. Each seat can face towards the parents or forwards, giving you flexibility for growing children. The toddler seats come with a 5-point safety harness and a footmuff each. There is also a bottle holder on the frame of the pram for convenience. The hood is made from breathable material so you can be sure your children will remain comfortable when traveling in the stroller. 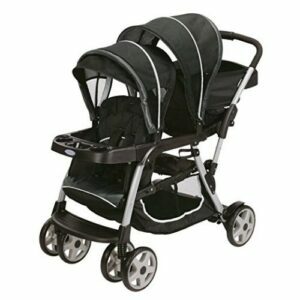 This comfortable inline twin stroller is great for toddlers and infants. It can be used as a single stroller before the second baby comes along – it is perfect for growing families. There is also the option to purchase additional seats – compatible car seats and bassinets are available to give even more flexibility. This means there is over 16 different seating arrangements, so you’re sure to find the perfect way to take your kids out and about. The twin stroller is similar in size to a single stroller, making it perfect for navigating crowded areas. The handlebar is adjustable, making it comfortable for anyone to push. Kids of all sizes will be comfortable riding in this stroller, too. Each seat can hold a child weighing up to 45 pounds, and the footrest has many different positions for growing children. This flexible twin stroller is perfect for a newborn and a toddler. It offers a dozen seating combinations, making it perfect for every family. The front wheels have suspension, to ensure both children have a smooth and comfortable ride. The tandem stroller offers one-handed folding for ease, as well as a parent tray including a drink holder. It features an extra-large storage basket, perfect for carrying all you need for two kids. Each seat on the stroller has its own canopy, and the front seat reclines to various positions. This means you can really customize the stroller as your children grow and their needs change. 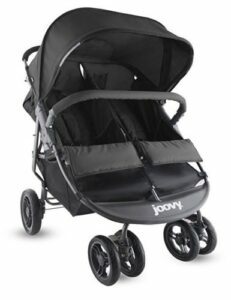 One of the best strollers for an infant and a toddler is the Baby Jogger City Select. It is perfect to use with only one child, as the front seat can be removed leaving you with a regular single stroller. As your family grows and changes, the other seat can be added. There is also the option to purchase bassinets and car seats to go with the stroller frame. This makes it the perfect stroller for any family with two young children. It does cost a bit more than some other double strollers on the market, but the flexibility and quality make it well worth the money. For parents on a budget, the Graco DuoGlider is the ideal choice. It has lots of parent-friendly features to make life with two kids easier. The size of the stroller makes it easy to navigate and store compared to some other double strollers. Each seat on the stroller can be customized to ensure both children have a comfortable ride. It’s also possible to add a car seat to this stroller, giving even more flexibility in seating arrangements.